Tom Selleck. Hulk Hogan. Zach Galifianakis. James Harden. What do all these men have in common? No Shave November is a month dedicated to the glories of facial hair. 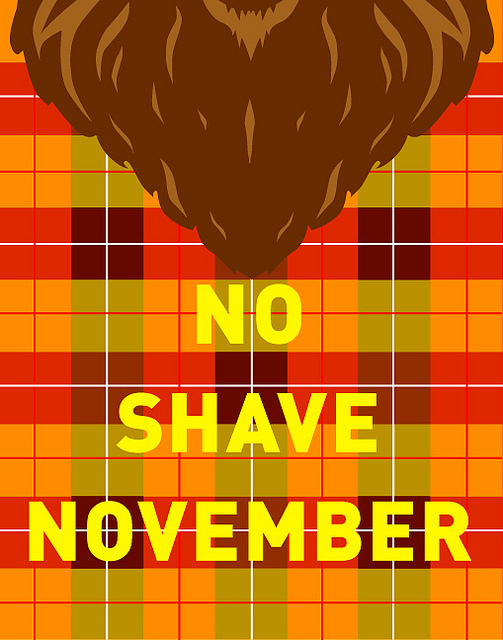 Some particpants decide not to shave to help promote causes like men’s health and prostate cancer, while others participate simply as an excuse not to shave. But beards aren’t the only thing celebrated in the month of November. The ladies are encouraged not to shave their legs as well. Student Paul Lloyd says he is participating in No Shave November for the fun of it. Lloyd said this is his first year not to shave. “I knew before that I had a pretty patchy beard, but I wasn’t fully aware it was this bad,” Lloyd said jokingly of his week-old scruff. Participants are encouraged to sign up on www.Movember. com and become a “Mo Bro,” someone who grows a mustache, or a “Mo Sista,” a female supporter of the moustache. • In a deck of cards, the King of Hearts is the only king not to have a moustache. •Police in a district in India’s Madhya Pradesh state are being paid to grow moustaches because bosses believe it makes them command more respect. • Salvador Dalí published a book dedicated solely to his moustache. • On average a man with a moustache touches it 760 times a day. • There are between 10,000 and 20,000 hairs on a man’s face. • A one-month-old moustache is capable of holding approximately 1 oz. of liquid or around 10 percent of a glass of beer before leaking its contents down the face of the owner. • Albert Einstein had a moustache for more than 50 years. • Groucho Marx for many years wore a fake moustache of greasepaint on stage and film, then grew a real one later in life. • In 1967, The Beatles gave away cardboard mustaches with their album Sgt. Pepper’s Lonely Hearts Club Band. • U.S. Marines are not permitted to grow moustaches longer than half an inch. • The first artifact that shows a moustache dates back to 300 B.C. and depicts a horseman with a thick black moustache. • The world’s longest moustache is believed to be a 14ft monster belonging to Ram Singh Chauhan of Rajastan, India, who regularly massages it with mustard and coconut oil to keep it healthy. • Women are more attracted to men with moustaches. On the website, “Mo Bros” can set up a personalized site where friends and family can donate and also keep track of the moustache’s progress. In 2011, Movember.com helped raise more than $15 million for men’s health, specifically prostate and testicular cancer initiatives in the U.S. alone, with more than 145,000 Americans participating, according to their website. Among those participating locally in Movember are members and staff of the Oklahoma City Barons hockey team. Thirty-six Barons players and staff, including players Alex Plante, Tanner House and Jordan Eberle, have helped raise more than $2,400 for Movember, said Barons Communications Director Josh Evans. The Barons participated in Movember last year as well, but perhaps have more reason to support men’s health this time around. In October one of their players, Brandon Davidson, was diagnosed with testicular cancer at the age of 21. In collaboration with Movember, the Barons also are offering $4 off walk-up ticket purchases during the month of November to anyone sporting a moustache (real or fake) to the games, according to their website. For more information about that, visit the team’s website at www.okcbarons. com.